End cap with standard female T / T2 thread. Useful to cover and protect telescopes, lenses, and accessories that have a male T thread. Total cap thickness is 6mm (0.18"). Female T / T2 thread specification of cap is M42x0.75. Made of black anodized aluminum. 5.0 (Based on 15 Reviews) 100% of reviewers recommended this product. To replace the poor fitting plastic plug on my C90, screws on, keeps out dust and dirt, lightweight anodised aluminium , well finished. I had a couple of t-mount camera lenses that had no end cap when I got them. Someone on cloudynights.com pointed me here. I ordered two and they fit perfectly and look nice. Now my lenses are protected while I store them. 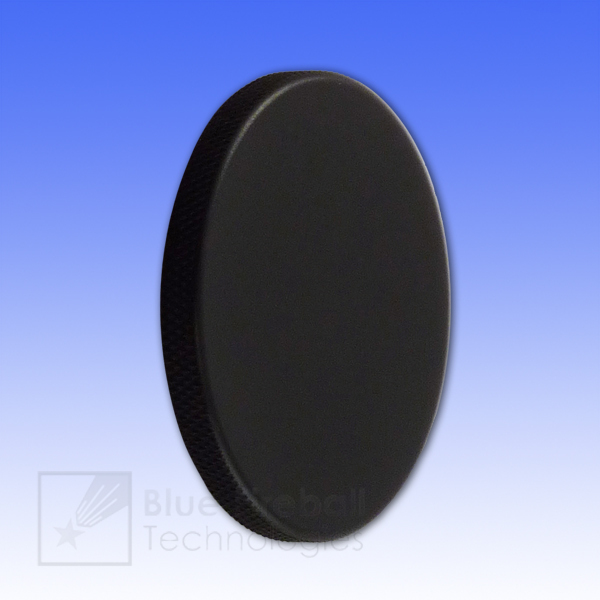 Typical of Blue Fireball products, the aluminum cap is well finished, cleanly threaded and way better than plastic caps for protecting expensive equipment. It is also reasonably priced for this quality. Makes a perfect end cap for cameras, scopes, and filter wheels. Threads mesh up perfectly and do not stick. Keeps dust out of sensitive telescopes much better than plastic end caps. Low price, extremely good value. Fit perfectly and build quality is excellent. Premium product at a budget price. I lost the end cap in my telescope at night. This one is a T thread and seals much better than the original. I feel much better about keeping dirt and dust out of my Mak. I bought 2 of these caps, one male and one female to close up the openings on my filter wheel when it's stored away. Good quality and fast delivery. These items are hard to find elsewhere. Thanks. Perfect match to cover the end of an optical train when the camera is removed. Review by Jeff G of CLT, NC. 5.0 Best option for T2 dust cap. The only option I've found to protect the threads and keep dust out of my filter wheel and other telescope equipment. Review by Looking Up of California. Used as a dust cap for t adapter on EOS. Fit is okay. Thread pitch seems a little off. Review by Len of Central Massachusetts. These caps are high quality and perfect for capping T thread scopes and accessories when not in use. A nice, affordable storage solution. Good quality and threaded well. Review by LarryF of Westchester, NY. 5.0 It's an end cap. It works. If I could say anything more about it, I'd be a truly great writer.